I believe that without a plan, there can be no true results. We all want to have things and achieve some level of joy and happiness, but are we willing to go the extra mile or journey, to get what we desire? 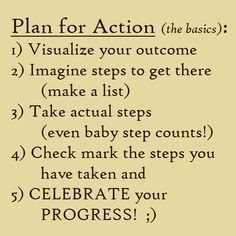 I ran across these plan of action steps and thought that they were worth sharing with you today. Take Note of them and get started, planning for action in your life. Share with me, in a comment below, your plan of action steps for taking action on some aspect of your life. P.S: Did you find this information helpful? If so, don't forget to share it with someone you know needs it.